IRVINE, Calif.--(BUSINESS WIRE)-- CoreLogic® (NYSE: CLGX), a leading global property information, analytics and data-enabled solutions provider, today released data analysis showing 758,657 homes in North Carolina, South Carolina and Virginia with a reconstruction cost value (RCV) of approximately $170.2 billion are at potential risk of storm surge damage from Hurricane Florence based on its Category 4 status. Current projections show it is likely Hurricane Florence could exceed a Category 4 storm. CoreLogic plans to release new figures for Hurricane Florence-related activity in advance of landfall to reflect the storm’s updated path and intensity. 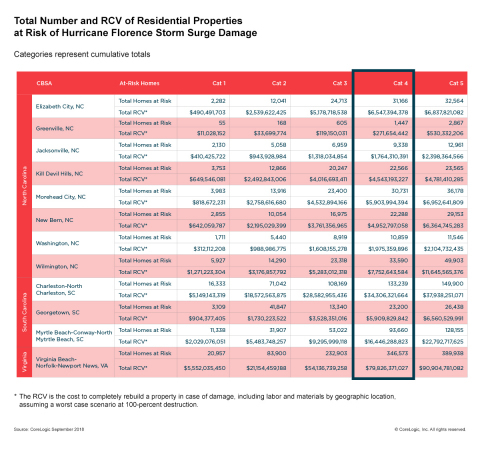 The table below shows the total number of properties at risk of storm surge for each of the five hurricane categories, as well as their accompanying RCV totals, for the Core-Based Statistical Areas (CBSAs) located along the North Carolina, South Carolina and Virginia coasts that could potentially be affected. Hurricane-driven storm surge can cause significant property damage when high winds and low pressure cause water to amass inside the storm, releasing a powerful rush over land when the hurricane moves onshore. For a complete view of total storm surge risk for all 19 Atlantic and Gulf Coast states and 86 CBSAs, download the 2018 CoreLogic Storm Surge Report. For Gulf and Atlantic Coast hurricanes that impact the U.S. this year, CoreLogic will provide pre-landfall data for number and associated reconstruction cost value of at-risk homes; post-landfall data for estimated insured property loss; and post-landfall data for insured property loss for wind, surge and flood. Visit the CoreLogic natural hazard risk information center, Hazard HQ™, at www.hazardhq.com to get access to the most up-to-date Hurricane Florence storm data and see reports from previous storms. CoreLogic offers high-resolution location information solutions with a view of hazard and vulnerability consistent with the latest science for more realistic risk differentiation. The high-resolution storm surge modeling using 10m digital elevation model (DEM) and parcel-based geocoding precision from PxPoint™ facilitates this realistic view of risk. Single-family residential structures less than four stories, including mobile homes, duplexes, manufactured homes and cabins (among other non-traditional home types) are included in this analysis. This is not an indication that there will be no damage to other types of structures, as there may be associated wind or debris damage and are not tabulated in this release. The data provided are for use only by the primary recipient or the primary recipient's publication or broadcast. This data may not be resold, republished or licensed to any other source, including publications and sources owned by the primary recipient’s parent company without prior written permission from CoreLogic. Any CoreLogic data used for publication or broadcast, in whole or in part, must be sourced as coming from CoreLogic, a data and analytics company. For use with broadcast or web content, the citation must directly accompany first reference of the data. If the data is illustrated with maps, charts, graphs or other visual elements, the CoreLogic logo must be included on screen or website. For questions, analysis or interpretation of the data, contact Alyson Austin at [email protected] or Caitlin New at [email protected]. Data provided may not be modified without the prior written permission of CoreLogic. Do not use the data in any unlawful manner. This data is compiled from public records, contributory databases and proprietary analytics, and its accuracy is dependent upon these sources.